My name is Amanda Parker, and I am the founder and President Old Yeller Ranch Rescue, a Non-Profit canine rescue in Los Olivos, CA. 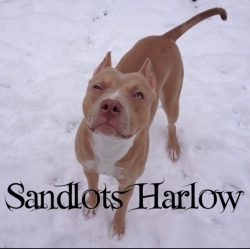 We established our rescue in only January of this year, and sometime around then, I reached out to Sandlot K9 for some guidance and advice in working with somany pit bulls coming to us with unknown stories and varying behavioral issues. Their willingness to help and meet with me was immediate, and it was evident that their love for all pit bulls and rescue work was as important to them as was growing their business. Sandlot’s desire to help our rescues has been not only in the support and guidance they have showed us, but also in actually assisting in an important rescue that without them could not have been successful. 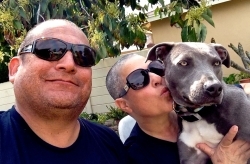 We rescued a pit bull from Baldwin Park, site unseen. Our facility was full and we are three hours North. I called Sandlot and expressed our dilemma and then took Charlie, the rescue into their board and train program that day! Charlie is now going into his wonderful forever home and will live out an amazing life, thanks to Sandlot K9. Charlie’s adopters are very excited about the obedience he has learned with Sandlot and having those obedience skills will make the transition into their home a smooth one. We have also sent some of our more challenging cases to Sandlot, and could not be more excited about the progress our dogs have made in their hands. The start-up of Old Yeller Ranch Rescue was a quick one. We dove in head first not entirely prepared for how much the world needed another rescue. From the beginning, Sandlot K9 Services has been a blessing for us and our dogs. 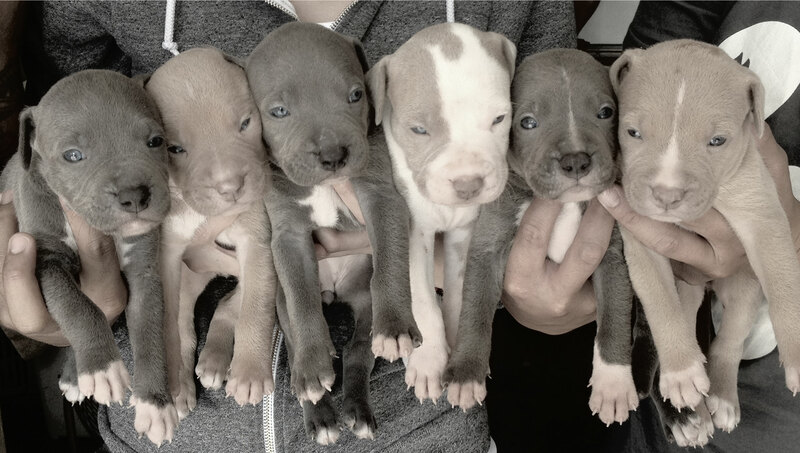 Their dedication to righting the wrong perceptions of bully breeds, their commitment to responsible ownership, their knowledge of not only the behavioral elements but the history of bully breeds, and their desire to help rescue whenever they can is amazing. 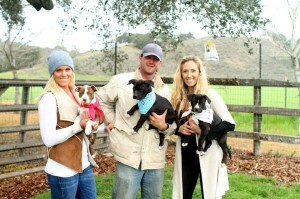 We couldn’t be more excited to work with Sandlot K9 as we grow our rescue. Hi, my name is David and we adopted Faith as a service dog. She was given up and had no prior training whatsoever. When we adopted her she was dog aggressive towards other dogs by playing very rough. We got her from a family that couldn't take care of her anymore and she didn't have any training or socialization for the first 6 months of her life. Since we took her in, she was already very aggressive towards other animals. She would pull on walks and lung and bark none stop towards any dogs or cats that she sees on the street. 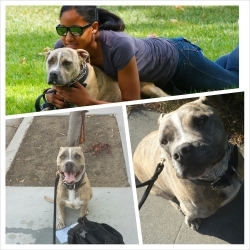 We took her to other professional trainers for about 3 months to resolve this issue. She was good for a week after we got her back from the other trainers but she was right back to the way she was again. We try buying videos and follow all sorts of advice from forums etc but none of it really worked. Then I called Andrew with Sandlot for the first session and they immediately taught me how to read the signs for aggression and how to correct her before she becomes aggressive. This made such a difference and immediately after the first session I was more confident in handling her in public and around other animals. I've learned that certain breeds like German Shepherds requires a different kind of training that your typical Petsmart obedience training cannot solve. I'm very grateful for their training and still training with Andrew on a regular basis for advanced obedience training and AKC CGC training. She is doing great around other dogs and children and plays calmly. Thank you Sandlotk9. Hello everyone, my name is Vicky, I had a very dog aggressive Pitbull named ICE. I first adopted him Long Beach Animal Care Services, and he was great with other dogs until he got attacked by a German Shepherd, after that he hated all dogs of any size. I called Sandlot K9 because one I am leaving for Military training soon and I wanted to get some problems taken care of so I don’t have to worry what’s happening while I am away for several months and I didn’t know what else to do. Dogs trainers now of days are all about the money. $300 for this, $200 for that, then finally I found Sandlot K9. I love Sandlot K9 because they care about the dogs and owners. We started on August 1st, 2013 and there have been major improvements. They told me that his aggression was crazy, and it can be fixed. The first two lessons where hard with him because he tried his hardest to fight back against us, to go after the other dogs, but after that he realized the dogs are not doing anything to him, besides barking or moving. We can get close to other dogs and ICE will just relax around them. I have so much more confidence now, finally I can take him to places without worrying so much on how he would react, because I know that I have the knowledge on how to handle him and what I have to do if he tries to go back to his old ways. They teach you step by step, they show you first how to do it, then the owners take over. One thing I love about Sandlot K9 is that they do not rush owner or the pets we take our time. It’s not like a regular training class where everyone doesn’t talk to each other, everyone who attends becomes like an extended family, we help each other out. Sandlot K9 has been a great blessing to my prayers. I don’t have constant stress or worries. I look forward to every class and see/learning new things. Even when I come back from my military training I plan on returning to keep going with ICE to keep improving. A nervous and lack of confidence dog; once after going through training with SandlotK9 has broke out of his shell and now is walking and running all over the world has to offer for him. Their training is very straight to the point and effective. You will literally see positive results in a couple days. Leash walking alone for my dog, Shadow, was effective the same day! IN LESS THAN 15MINS! My dog and i are a living testimony on how well Sandlotk9 can train a dog. Shadow has recently finished his basic obedience training and he is also looking forward for new tricks as we go on their complete training program. The staff just don't sit and look pretty, they will personally get hands on with your dog if thats what it takes to achieve it! You are the trainer, they are the coach. 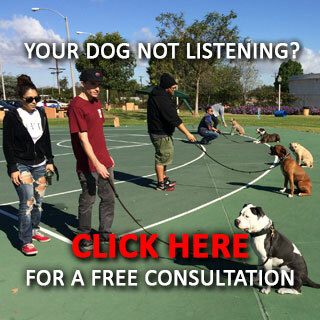 Listen to them and you will have one happy trained dog! Personality wise with these guys, i couldn't ask for a much more friendly and down to earth people. Very easy to talk to. For those of you reading this, and feel a bit skeptical about enrolling your dog in their training program. I say GO FOR IT! 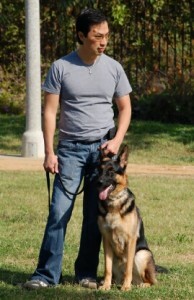 leave your skeptic feeling behind and experience the wonders and great dog training these guys has to offer. This is Charles and Jessica testifying on the great work ANDREW and DEVELL has done! THANKS GUYS! Hi, my name is Laura and I am a live in caregiver for my elderly parents. My dad has prostate cancer and my mom is a 4 time cancer survivor who is now in the final stage of kidney failure. My parents have never been animal lovers, and I am just the opposite. About a year ago I brought home a new dog...a pit bull! Of course this didn't go over well with my parents as to them (and so many others) this breed is nothing but trouble. Everything I had ever heard about the breed made me a little worried at first too. I decided that I needed to learn as much as I could about the breed that is so often misunderstood. Also, living with my elderly parents made it even more important for this dog to be well behaved and well trained. This is when I came in contact with Andrew and Devell of Sandlot k9 Services It wasn't long before Shiloh and I were members of team sandlot! These guys are wonderful! They are patient and caring and Shiloh loves them too! I would recommend them to any dog owner! They don't train my dog, but rather, teach me to train her. They are always there to answer my questions or talk me through my concerns. Through Andrew and Devell I am learning everything I can about the breed and being a responsible pet owner. Been through 2 other trainers in my area, i didnt know what to expect from Sandlot K9. But I wanted to try because they recently expanded from Los Angeles to San Diego, after just 1 session with them i was blown away about how they really know their training methods why it works vs other methods, they even gave me the option for any method I wanted to use and they'll explain which one they like and why!